The many reasons to love the Mediterranean diet. No calories to count, you won’t go hungry, You simply trade good fats for the bad fats. You’ll get more plant based protein from vegetables, fruit and nuts. You eat more fish and poultry and less red meat. You’ll eat fruit for dessert. 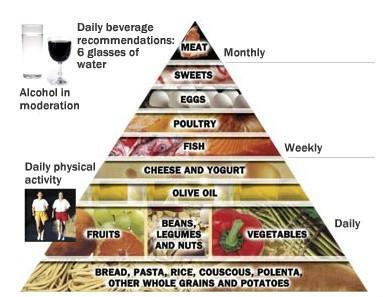 Follow the foods suggested on the food pyramid. Due the exercise, like walking and don’t forget the wine. The Mediterranean diet is the diet of the people living in the Mediterranean region of Europe. They have always been a mystery to science because they seem to be much healthier than people in other parts of the world. This food pyramid illustrates what they eat and how often you should eat each food group. With this diet you don’t have to count calories. Remember if you want to try this, stick to the chart and only eat these foods and only drink water and the one glass of red wine. Do the extra walking they recommend and don’t expect to lose weight immediately. You will become a healthier person and the fat will disappear.